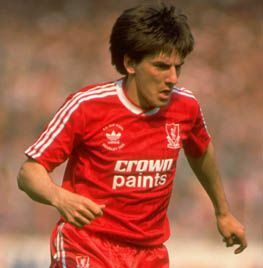 Geordie forward Peter Beardsley dribbled and shimmied his way to 175 games and 59 goals in a red shirt, winning two leagues and claiming an FA Cup along the way. Kenny Dalglish broke what was then the British transfer record by paying Newcastle £1.9m for Beardsley's services in July 1987. With John Barnes heading to Anfield that same summer, it did not take long for the new recruits to find their feet and gel with striker John Aldridge. The attacking trio linked up to good effect to get Aldo off the mark after nine minutes against Arsenal in the opening game of the 1987-88 campaign. Beardsley started as he meant to go on, notching 18 goals in 48 games in an impressive debut season in which the Reds finished as First Division champions. With Rush trying his hand in Italy with Juventus and player-manager Kenny Dalglish deciding to make only the occasional first-team performance, Beardsley and Aldridge emerged as Liverpool's new intimidating forward partnership. An FA Cup triumph over Everton in 1989 was followed by a second league title for Peter in 1990. Other memorable moments of his time with Liverpool included a hat-trick against rivals Man United in a 4-0 rout at Anfield in September 1990, and his performance against Nottingham Forest in April 1988. In a game many Kopites consider to be Liverpool's finest 90 minutes of football, Beardsley created two goals and scored another in a total demolition of Brian Clough's side. The appointment of Graeme Souness as Liverpool manager was the beginning of the end for Beardsley's time at Anfield. Sensing his first team opportunities would be limited following the arrival of Dean Saunders in June 1991, Peter made the trip across Stanley Park to join Everton for £1m two months later. A 95 game stint with the Blues returned 32 goals, but in 1993 Beardsley was to return home to Newcastle for his second spell on Tyneside. Under Kevin Keegan's stewardship, Beardsley scored 25 goals in all competitions in his first season back at St. James' Park. The following year, Newcastle looked set for a Premier League title but dropped a 12-point lead to eventually finish second behind Man United. Beardsley was also a regular fixture on the international scene with 59 appearances and nine goals for England to his name. After brief spells with Bolton, Man City, Fulham, Hartlepool United and Melbourne Knights, Peter ended his playing career with Doncaster Rovers. He has once tried his hand in the dugout, with a brief tenure as deputy when Howard Wilkinson was England's caretaker manager between 1999-2000.